The success of your WordPress site heavily depends on the theme you choose for building a website. 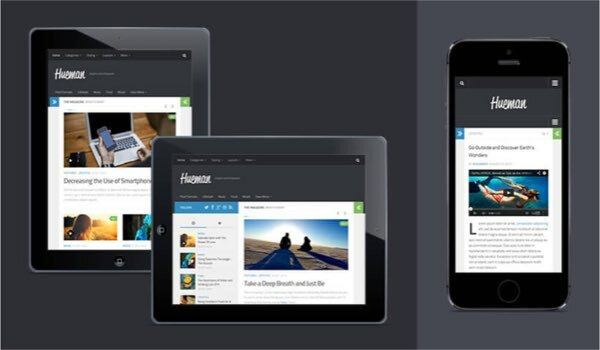 There are thousands of free and commercial themes showcased on the official wordpress.org site. Choosing one from the lot is really a tough task and we make the task bit easier for you. Here is a list of top 10 free WordPress themes available on the WordPress repository. You can download, install and activate these themes on your site from admin panel. Note, there is no free lunch. All the theme developers offer limited version as a free download and charge you to get the premium version. We believe one of the free themes is sufficient for a normal content site offering blog and store. If you own or build a full fledged business site then we highly recommend to check the commercial theme offered on official wordpress.org site instead of looking for free ones. We also mentioned the cost of offered premium versions of the top 10 listed free themes. Customizr is the most popular free theme available in WordPress themes repository. It has more than 100 thousands active installs with more than thousand daily downloads. Customizr supports full width header slideshow, boxed image slider and multiple layouts. You can use left sidebar, right sidebar, full width or three columns layouts for posts and pages. The pro version is also offered through developer’s site with additional features which will cost you $49.95. Hueman is the second top reviewed free theme in WordPress repository. It powers more than 70 thousands of WordPress site and is developed by the same author of the Customizr theme. You can change the layout with right sidebar, left sidebar or three columns. The author also offers an addon plugin or shortcodes and floating social sharing buttons. It supports featured slider, comment count on featured images, header and footer customizations. Though it is fully responsive, when used with three columns the right sidebar will disappear on mobile devices and needs to click the arrow to view the right sidebar as a slide out on iPad. GeneratePress has more than 50 thousands of active installs. It is a fully responsive and lightweight theme with multiple sidebar options. 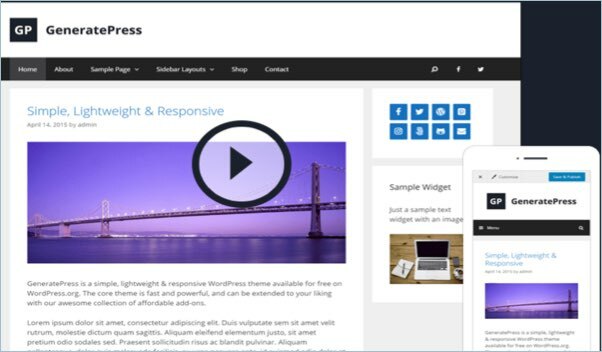 The free version is fully compatible with major plugins like WooCommerce, BuddyPress, bbPress, etc. The premium version will cost you $39.95 with additional features like sections, page header, masonry layout and additional menus. 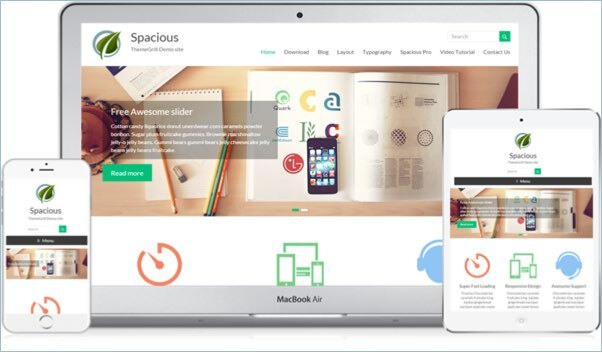 Spacious is a responsive, multipurpose theme actively installed on more than 70 thousands WordPress sites. It offers header slideshow, featured widget, testimonial widget and optimized for speed. It also offers call to action widget, layouts with sidebars, full width layout and custom CSS option. The pro version will cost you $69. 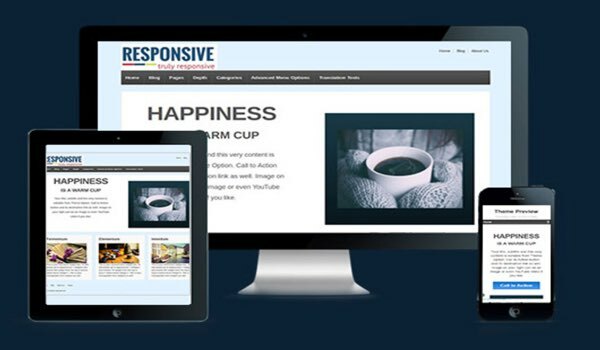 Responsive is a free WordPress theme powers more than 100 thousands websites. 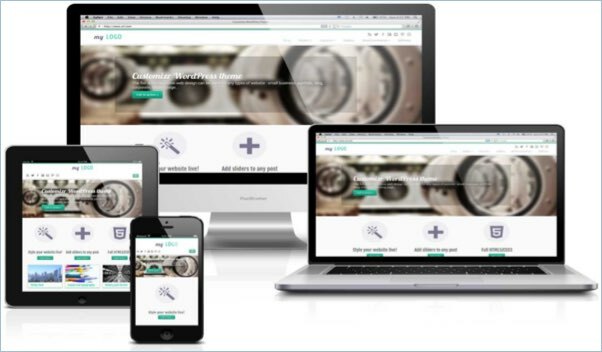 It completely focuses on providing a fluid responsive layout so that your site will look perfect on all devices. The pro version is billed based on monthly ($7), annually ($67) or one time ($249) subscription for all themes offered by the developer. 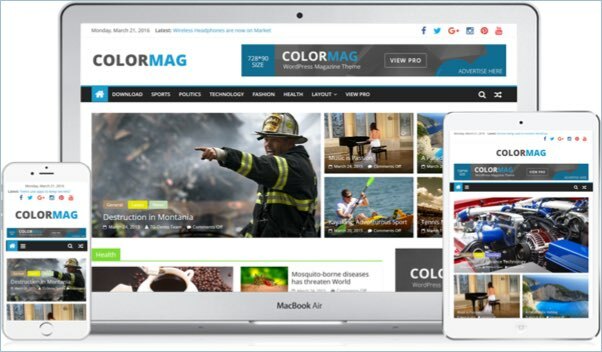 Colormag is a magazine style theme used for creating quick and stylish news, magazine, technology and general blogs. It powers more than 70 thousands of WordPress sites and the average download exceeds more than 1200 per day. Each category is displayed in different color and makes the home page attractive. It supports WooCommerce, fully responsive, has a featured slider and other widgets. While the free version can be downloaded from WordPress repository, the pro version with enhanced features can be purchased for $69 from the developer’s site. 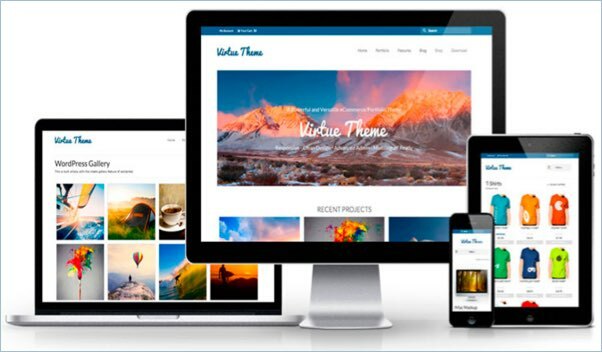 Virtue is a Bootstrap theme that powers more than 70 thousands WordPress sites. You can build online store, portfolio, business sites and it supports WooCommerce. It will cost you $45 per year to get the premium version. 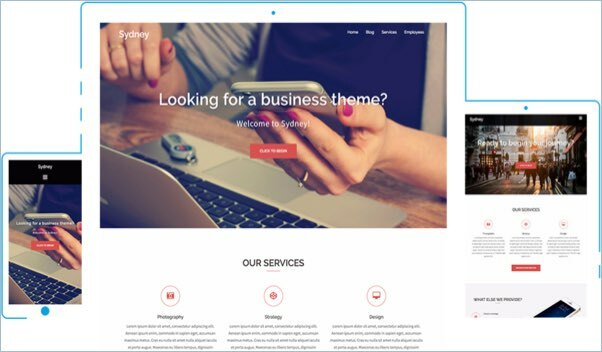 Sydney theme powers more than 100 thousands WordPress sites and the daily average download exceeds 1000 times. It is a fully responsive theme offers beautiful header slideshow and variety of widgets. The pro version will cost you $49 per year. 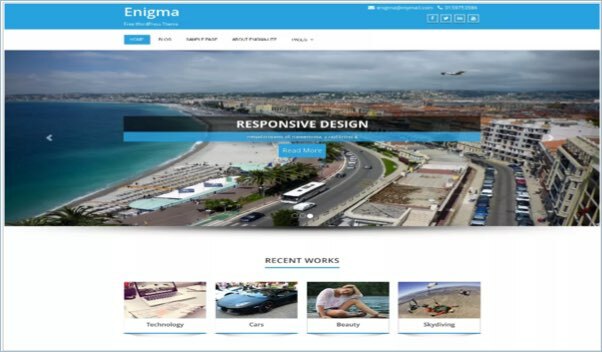 Enigma is a Bootstrap theme that powers more than 30 thousands WordPress sites. It offers header slideshow, blog carousel, sidebar and full width layouts. The premium version will cost you $39 one time payment. 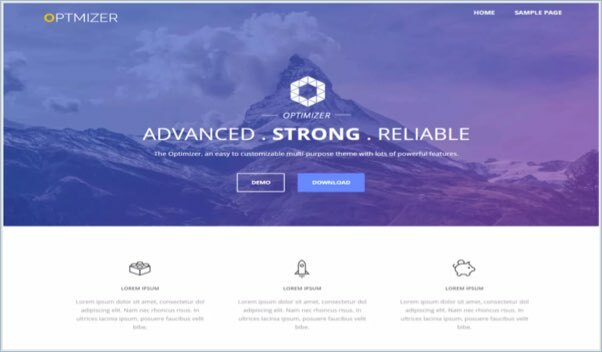 Optimizer is a multipurpose free WordPress theme that powers more than 20 thousands websites. It is a fully responsive theme and supports popular plugins like WooCommerce. The pro version will cost you $59 one time payment for single website license. Thanks for useful article，in fact i think generatepress is very good. Thanks for sharing these top 10 free WordPress themes. I found all of these very useful and effective . Nice collection, some of my favourites themes. Thanks for the input, article is updated. Good collection and very useful, i was looking for magazine style theme and i like the Colormag theme. But the footer link needs to be removed manually from the template files and not offered as free option.